Two members of the Greenville Drive have been named to the South Atlantic League All-Star Team. Mookie Betts has been named as a utility infielder, and David Chester (pictured) makes the squad as the starting designated hitter. It is the first all-star selection for either player in their professional career. Betts, who has played exclusively second base for the Drive, was named the SoxProspects.com Player of the Month for May, when he hit .356/.472/.663 with six home runs. Overall, the 2011 fifth-round pick is hitting .280/.417/.509 on the season with eight homers, 14 doubles, and 11 stolen bases. He ranks second in the league with 41 walks, compared with only 25 strikeouts. 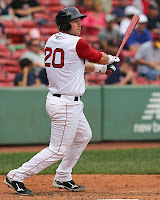 Betts was also named South Atlantic League Player of the Week for the period from May 6 to May 12. The six-foot-five, 270 pound Chester has been Greenville's biggest power threat this year. Splitting his time between first base and designated hitter, he is hitting .260/.344/.464 with a team-leading nine home runs and fifty hits. The Bunyanesque Chester was a 33rd-round pick in 2011 out of the University of Pittsburgh after leading the Big East in home runs that season. The All-Star Game is scheduled for Tuesday, June 18th at FirstEnergy Park in Lakewood, New Jersey, the home of the Lakewood BlueClaws.